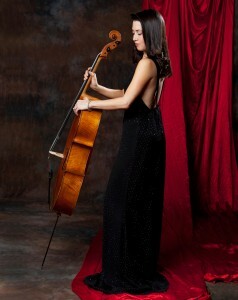 Cello virtuoso KRISTINA REIKO COOPER has won worldwide acclaim for her musical diversity, artistry, and charismatic stage presence. Her credits range from having received her Bachelors, Masters, and Doctorate of Musical Arts at The Juilliard School to currently serving as visiting professor at Tel Aviv University, Israel. Although well-known for traversing musical genres, she first established her career as a classical artist. Hailed by The New York Times as “sensational in concert” and as a “striking virtuoso” by the Los Angeles Times, Kristina has performed as a soloist and chamber musician on many of the world’s most distinguished stages including Carnegie Hall, Lincoln Center, The Kennedy Center, Suntory Hall of Tokyo, Radio France in Paris, and appearances with the Prague Chamber Orchestra, the Toronto Symphony and the Tokyo Yomiuri Symphony. Her many festival appearances include The Lincoln Center Summer Festival, Mostly Mozart, Musicians from Marlboro, Bang on a Can All-Stars, Stresa International Music Festival, Aspen Music Festival, and Spoleto Festival USA. Kristina recently made her acclaimed solo Carnegie Hall Debut with the Tel Aviv Academy Orchestra. An enthusiast of new, popular and contemporary works, Kristina is well-known for her adventurousness. She has had many original works written and commissioned specifically for her. Among the composers that she has worked with are Phillip Glass, Mario Davidovsky, Josef Bardanashvili, and Roberto Sierra. As a chamber musician, Kristina received the Walter M. Naumburg Chamber Music Award first prize. She has been a member of many renowned ensembles, including the internationally acclaimed Quartetto Gelato, Opus X, and Intersection. She was also the musical director of The Israel Chamber Music Society and is on the board of the America Israel Cultural Foundation. Kristina has an extensive discography of CD and DVD recordings, including many best-sellers. She has been featured in a few widely broadcast DVD’s including Quartetto Gelato–A Concert in Wine Country, and a solo recital DVD in Steinway Hall through Amadeus Press. Kristina has been heard often on National Public Radio, the Canadian Broadcasting Corporation, and NHK in Japan as well as in television broadcasts for CNN, PBS, CBC Television, CBS’s 60 Minutes. Kristina received her bachelors and masters degrees in music and her doctorate of musical arts from The Juilliard School where she studied with Joel Krosnick, Robert Mann, and Felix Galimir. She is currently a visiting professor at Tel Aviv University, and plays on the 1743 “Ex-Havemeyer” Guadagnini Cello and the 1786 “Bonaparte” William Forester Senior cello. Kristina’s most recent release is the acclaimed Around the World with Love multi-media project and CD which adds yet another gem to her already brilliant array of musical programs. Kristina is also available for student outreach programs.